My falling stars, my dark endeavor. You were bitterness, lies, a bill of goods. That hold my awkward childish verse. For you—alas, they were too many. I take things from left and right. and we did not dare to turn and meet one another’s eyes. choice; an Asian reed pipe’s slender voice. To their coarse praise I do not listen. They shall not have from me one song. Of wormwood smacks your alien bread. Sought to evade a single blow. More tearless, simpler, than are we. Then how are we graced with this light? That all longed for, but none ever knew. As though, for the first time I saw my country. It is my soul, It is my body, too. Of the frost that daily grows more keen! The white-flaming bush is forced to lean. When we two together passed this way. As hard and clear, a memory lies in me. It is such pain and yet such ecstasy. Than one who listens to a bitter tale. You have been changed into a memory. Changes and will not change back. It rustles its suggestive dress. Woven of fantasy, silken and bright. Is she who gave over her life for one look. Our mood is too tender for talk. The slight silver clink of your spurs. Thank god there’s no one left for me to lose. It’s not with a lover’s lyre, not at all. That I go around, attracting a crowd. That in my hands keeps singing aloud. And my foot is on the edge of the grave. staring me down. serene and pitiless. should be mysterious stairs in the song/lyric “Listening to Singing.” Thanks for sharing these lyrics. Thank you for sharing. Iris Dement is an absolute gift to this world! Her ambition and talent shine through once again in this endeavor. If you haven’t, see her in person– she will blow you away. Thanks for the comment. 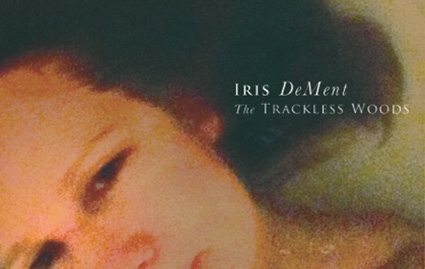 I have been able to see Iris Dement a handful of times over the years in Pittsburgh, PA and in Charleston, WV. The shows were wonderful. Just saw her in tiny York, SC – she was on her way to Charleston and seemed a little stunned to be here. Nevertheless, she was welcomed greatly and I’m still floating from her sound. I forgot to take tissue – had ‘t seen her in twenty years and hadn’t listened to her lately, so I forgot that when I hear her voice I cry. Listening now to Trackless Woods and smiling between tears. What a treasure.